The Riigikogu passed with 58 votes in favour (41 against) the Act on Amendments to the Social Tax Act, the Income Tax Act and Other Acts (41 SE), initiated by the Government. The Government declared the passage of the Act a matter of confidence. Minister of Finance Sven Sester emphasised that the changes made with the Act are a source for covering the implementation of other Acts that were also bound to the issue of confidence by the Government. He added that the proposed amendments would shift the tax burden from workforce more towards consumption. The Act provides for reduction of the rate of social tax from the current 33 percent to 32.5 percent in 2017, and to 32 percent starting from 2018. With the amendments to the Income Tax Act, the basic exemption rate will be gradually increased over four years to 205 euro per month by 2019. Next year, it is planned to amount to 170 euro. The basic exemption deductible from pension will be raised from the current 220 euro to 225 euro per month, in order to ensure income tax exemption on the average pension. At the same time, the limit of the daily allowance for assignment abroad exempt from tax will be increased to 50 euro, instead of the rate of 32 euro that has been in place since 1994. The Act organises the rules for the taxation of income from rent so that, on the income tax return, 20 percent will be deducted from income received under a residential lease contract, without submission of expense receipts, for covering the expenses related to the lease. In connection with the plan to increase child benefits, the increased basic exemption upon provision of maintenance to children will be separated from the rate of general basic exemption and will be fixed at today’s level of 1848 euro per year, that is, 154 euro per month. The total amount of deductions allowed from the taxable income of natural persons will be reduced from 1920 euro to 1200 euro. The amendment concerns the right to deduct from income the housing loan interests and training expenses paid, and the charitable gifts and donations made starting from 2016. In this connection, the current 5 percent rate regarding the deduction of donations will be abandoned. Starting from 2016, the expenses on driving schools and adult hobby training will no longer be treated as deductible training expenses. No changes will be made to the structure of the expenses related to formal education and in-service training, and hobby education of young people aged up to 18, and they will remain deductible. With the amendments to the Value Added Tax Act, the VAT on accommodation services will be raised from 9 percent to 14 per cent starting from the beginning of 2017. The raising of the tax rate is planned to increase the receipt of value added tax by approximately 10.2 million euro in 2017. With the amendments to the excise duty Acts, alcohol and tobacco excise duty rates will be raised. The Bill will replace the 10 percent rise the of the excise duty rate for alcohol due in 2016 with a 15 percent rise of excise duty rate as of 1 February 2016. As a result of the raising of alcohol excise duty, an estimated additional 22 million euro of excise duty and VAT income will be received in 2016. Tobacco excise duty will be raised by additional three percent in 2016–2018, in addition to the five percent established earlier, while the rise due in 2016 will enter into force on 1 June 2016, that is, half a year later than provided for by the current Act. As a result of the raising of tobacco excise duty, an additional 24 million euro of excise duty and VAT income will be received in 2016. Excise duty on alcohol and tobacco will also rise by 10 percent in 2019 and 2020, except for the excise duty on wine, which will rise by 20 percent. The rate of excise duty on petrol will be raised by 10 per cent over the next three years. The rate of excise duty on diesel fuel will be raised by 14 percent as of 1 January 2016, and by 10 percent in 2017–2018. With a view to more equal taxation of two most common motor fuels – diesel fuel and petrol –, taking into account the energy value of these fuels, the rise of the rate of excise duty on diesel fuel will be greater next year. When raising the rate of excise duty on light heating oil, the rises of the rate of excise duty on diesel fuel will be followed closely. Starting from 2016, the rate of excise duty on diesel fuel for specific purposes will be 27 percent of the rate of diesel fuel. The rate of excise duty on heavy fuel oil will be raised from 15.01 euro to 58 euro per 1000 kg, and the rate of excise duty on shale-derived fuel oil will be raised from 15.01 euro to 57 euro per 1000 kg as of 2016. The rate of excise duty on solid fuels used for heat production, that is, coal, lignite, coke and oil shale, will rise from 0.3 euro to 0.93 euro per one gigajoule of the upper calorific value of these fuels starting from 2016. As a result of the raising of fuel excise duty, an additional 64.7 million euro of excise duty and VAT income will be received in 2016. The due date for payment of the excise duty will be shifted from the 15th day of the calendar month to the 20th day of the calendar month. With the changes in the rates of excise duty, the state budget expenditures will increase by a total of approximately 111 million euro in 2016. The Government also entered a motion to amend in the Act, according to which the Government will submit to an analysis the Riigikogu by 1 March 2018 at the latest and, if necessary, a proposal to change the excise duty rate if the provisions of the Act or the amendments made by this Act bring along unexpected circumstances with negative impact, among other things, on public health, consumption, entrepreneurship or the proceeds from excise duty. Members of the Riigikogu asked the Minister of Finance many questions. 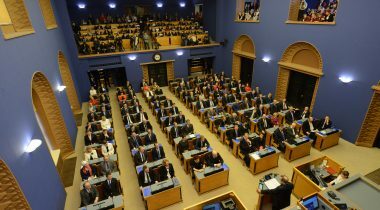 32 members of the Riigikogu took the floor during the debate.